"You better stay close to me"
"One shouldn't judge by appearance, Arcee is a sufficient threat to her enemies. Although she gives the impression of an angel to her friends, her excellent combat capability makes her a devil to her foe. She is willing to do anything that will bring the defeat of her enemies, that belief along with a hash combat training and mental discipline help her grow into a fierce hunter." Finally, a figure for a transformer that never got a toy in 1986 Transformer The Movie, it's only 29 years late as they say, better late than never. 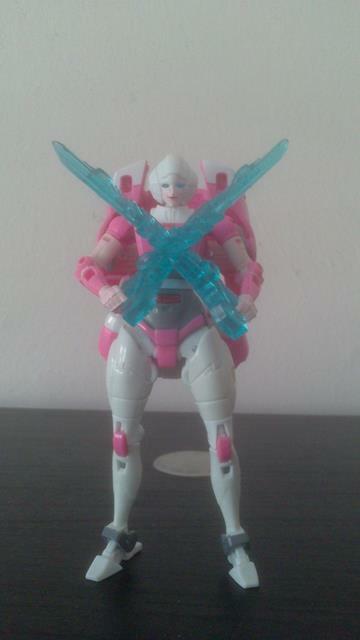 I have already talked about how much I adore G1 Arcee, so I'm not going bored you guys with the same old story again so instead I'm going to talk about the mini comic that included in this figure. The comic is just a funny story about the character of the figure, no real story here. It's just an insight of Arcee's daily life. Arcee is taking care of Rattrap in this comic (Rattrap refers Arcee as Aunt Arcee), a call back to Beast Wars for those who remember. Anyway Arcee woke up late this morning, so she is rushing to make breakfast and wake up a very surprised Rattrap. Well, it seems like Rattrap have missed his school bus so no biggie, Aunt Arcee just transforms into her ALT mode and zoom Rattrap to school, Arcee is driving so fast that Rattrap is barely able to hold on, way to go Aunt Arcee. Well, my Japanese aren't that good, so I'm not sure what is going on next, but somehow Arcee ended up baby sitting Rhino, Tigatron and Optimus Primal. Slumber party? No matter what the reason, Arcee is busy preparing dinner for the group by chopping some vegetable with her Energon sword.. Isn't that kinda dangerous? Hey Aunt Arcee! Remember, you got children around, use a proper kitchen knife! Well, as short as it is, it's a fun thing to read. Just wish my Japanese was better so I can fully understand what happen near the end. 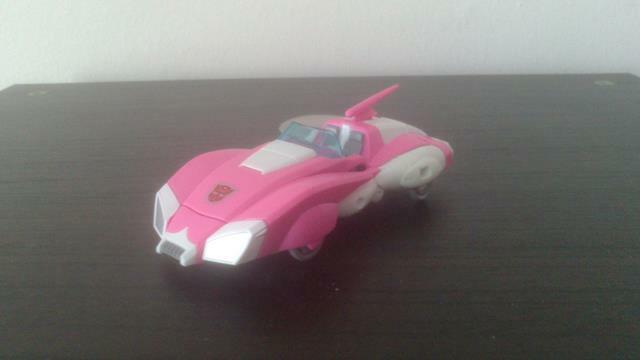 This is just a repaint of the Hasbro release of Arcee, so she remained as a Cybertronian sport car. In the car mode, she is mainly pink and white with silver on the headlights and gray on the interior of the car (dash board and seats), It's quite accurate to how she appears in Transformer The Movie. Like the Hasbro version, she still can't roll unless you want the paint on her crotch to get scratched. Additional to that, because of the design flaw of her hand in ALT mode, you might also scratch the paint on her hand if you roll her in ALT mode. Other than that, there isn't anything differ than the Hasbro version. Hasbro version has the black to separate all the pink and white so it actually looks more interesting than this version. But if you are like me, waiting for this over 20 years, then you might love this version more. Just saying. Like the Hasbro version, transformation to robot mode is quite simple and interesting. 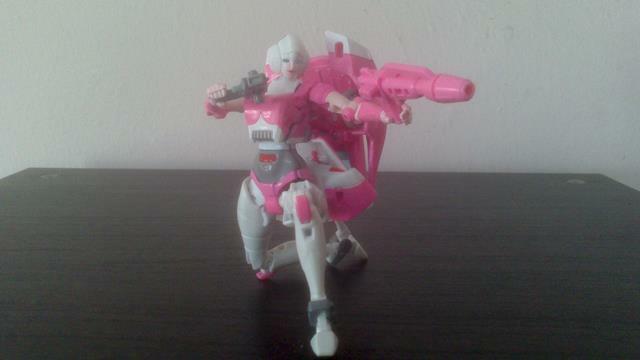 In robot mode, she has the same coloration as her ALT mode, she is mainly pink and white with some gray on her stomach and feet and additional to that some lighter pink for face and part of her arms and hand. She also has some red on her stomach and a painted Autobot insignia on her chest. Paint wise, this version got more painted details, but because of her palette, some may prefer the Hasbro version more because again, the black highlight do a nice job in breaking all the pink and white. 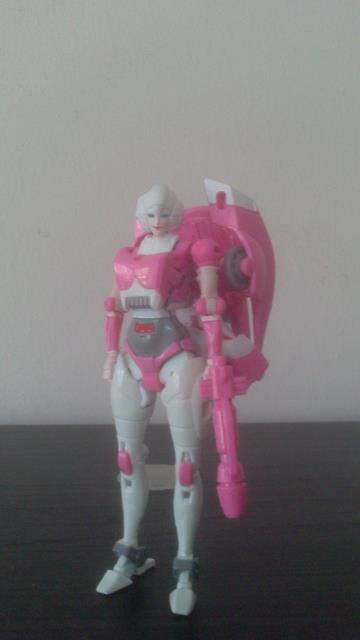 But this is much more accurate to G1 Arcee. Her head is nicely done like the Hasbro version, good paint job and great light piping, but this version got a more prominent lipstick, giving her a warmer smile. But unlike the Hasbro version, this version's head can't turn properly, I'm not sure it's just mine or they did something to either her head or neck, whenever you turn her head to the side, it will unpeg the transformation joint, it's not a big problem, but it's still quite annoying. Her hand however is a disappointment, it's badly sculpted and include a design flaw that prevent any weapon from going all the way in. So any weapon that she holds, it just seems like she not holding any of it properly. 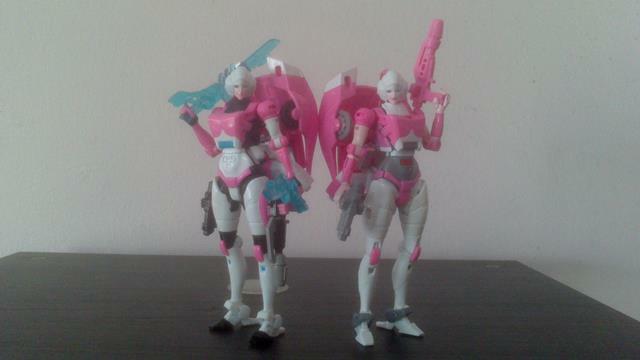 However, I understand that this might be Hasbro's fault as the newer release of Arcee also have this problem. Not sure why Hasbro change it, but Takara should have known better and fixes the hand. OK, so beside the minor problem with the head joint and disappointing hand, everything else is pretty much the same as Hasbro version, she got the same articulation. Arcee's head can rotate 360 degrees and as a bonus, she can look up but can't look down. Her arms can rotate 180-360 depend on how you move them, almost do a full 180 outward, rotate on the upper arms and more than 90 degrees bend on the elbow, sadly no rotation on the hands/wrists. Her legs can rotate forward slightly more than 90 degrees, not much backward movement as it is limited by the backpack, not much outward movement due to the shape of the legs, but I suppose you can manipulate the transformation joint to get more outward movement, but you still won't get a full split. There's rotation just above the knee, more than 90 degrees bend on the knee (just like the elbow), her ankles can move forward and backward due to transformation. All in all Arcee has a lot of articulation and flexibility even if she doesn't have hip\waist articulation. 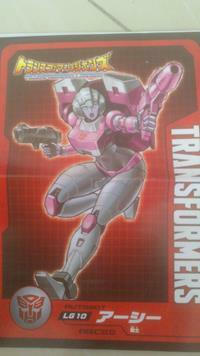 Arcee's robot mode look pretty nice and quite accurate to how she is presented in the Trasnformer The Movie. The only thing she doesn't have in the movie is her huge backpack and disproportion hip and thighs. Now for accessory, well she has the same weapons as the Hasbro version, 2 clear blue swords, one handgun and one slightly bigger handgun, however unlike the Hasbro version, the guns are unpainted. It seems like they used up all their paint budget on the figure. So she has one gray gun and one pink gun, which can be held on the hand, even though it's only halfway or attach to the legs or on the arm Megatron style. There are also a number of places for you to attach the weapon in ALT mode. Durability: 8, Its pretty solid, nothing fall a part and nothing to beware of. 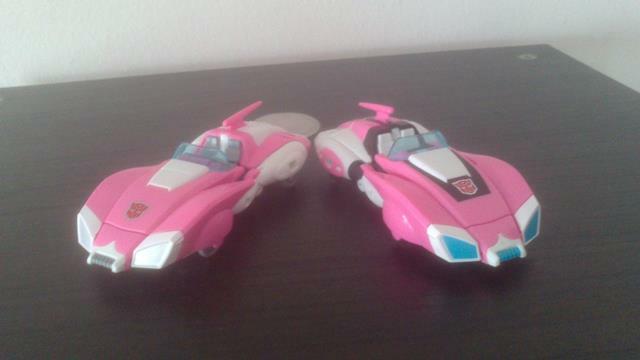 Fun: 6, Arcee's car mode can't roll well, but her robot mode has more play value. Aesthetic: 8, It's 90% accurate to the G1 design, so it's really really really close, again, unless Takara gives us a masterpiece, I don't think we will get a better one from either Hasbro or Takara. Looks good in both vehicle and robot modes. Articulation: 8, Arcee has tons of articulation and flexibility and the best thing is, all this articulation do not hinder her ability to stand up properly even with the huge backpack. Another point to note is that it seems like there is a hole for a figma stand on her backpack, I don't have any figma figures so I can't really test it. If I have any complaints, it would be that Arcee can't really pull off any feminine poses because of the design choices... But an expert will probably be able to pull some off with the aid of an optical illusion. Price: 3.5, Legends Arcee is still new, so she should be widely available, but I have been hearing a rumor of stock shortage for the fembots, as the writing of this review, I still haven't received any notice from BBTS about Chromia and a lot of people still haven't received any news from HLJ, so yeah her price might shoot up and being an import figure doesn't help. Overall: 8, I would absolutely recommend this figure to anyone, she might have more problem than the Hasbro version, but she also looks good and she is a solid figure. Plus, who knows when are we getting another G1 Arcee from Hasbro or Takara, any transformer fans should want this figure, the only people that probably don't want this figure are fans who already have a 3rd party in their collection or those who prefer the Hasbro version.